A special moment between Kevin and I caught on camera by Photographer Jill Steinberg. There are moments in life when, all of a sudden, everything falls in place; when some of the craziest ideas seem actually possible; and when one comes to the realization that dreams may, in fact, materialize. Those brief moments of lucidity, those epiphanies are rare, but they surely make a lasting impression. On August 13th, 2016, our last day of shooting, I was standing in front of the monitor watching Catherine Curtin deliver her final scene when it all finally sunk in and I experienced one of those rare moments. As I heard Kevin Newbury, our brilliant director, say “cut!”, a surge of emotion poured out from me; I looked for Kevin, hugged him and wept. For seven days, I had witnessed a group of extraordinary people make extraordinary things, but I, like everyone else, had been solely focused in making this film work. It was only when we entered the final stretch that I actually comprehended that everything happening around me was real. After that moment, Reed Luplau entered the set one more time and we finally heard the magic words “it’s a wrap”. We had finished our #epiphanyfilm shooting. With Raylene & Ron, Kevin Newbury’s parents, at Camp Wakuta. I landed at PWM airport on Sunday, August 7th. Ron, Kevin’s dad, went to pick me up and he drove me to his and his wife’s property in New Hampshire. As soon as I arrived I was welcomed by Raylene, Kevin’s mom, who during our stay went to incredible lengths to make sure all the guests were comfortable and well fed. Their property consists of several acres of land, complete with a lake and several cabins located all throughout the property. Camp Wakuta, as it is officially known, was started by Raylene’s grandfather back in 1953 and it continued until 1967. After that, the family continued to host summer camps sporadically but nowadays they keep it exclusively for family and friends. We were incredibly lucky to count with such a vast and varied location for our shooting (especially considering the many different types of scenery where Screenwriter David Johnston’s otherworldly “Another Dance of Death” takes place) and Kevin made the most out of it. 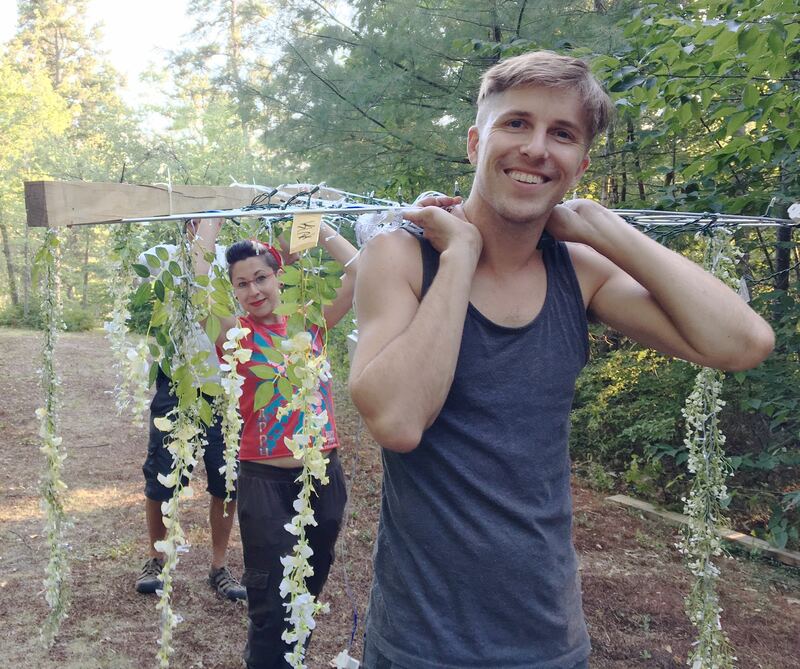 Vita Tzykun, Production Designer & Clark Parkan, Art Director, building the canopy on top of the dance floor. I started to work as soon as I arrived, helping Vita Tzykun, our masterful production designer, and Art Director Clark Parkan, tackle the construction of the most complex set: the dance floor. Also present was Assistant Director Marcus Shields, who performed the most varied functions with his accustomed unflappable discipline and calm demeanor. On Monday, August 8th I woke up to the magical sounds of numerous birdcalls, some of them more familiar than others, but all beautiful and clearly distinct. One, however, caught my attention above all: the loon. The loon’s call pierced throughout the forest amplified by what seemed like the acoustics of an impossibly large cathedral, dissolving into the dawn as magically as it had emerged from it. Work on the sets continued that day and in the evening a much-awaited van driven by our resourceful Producer Matthew Principe arrived from New York with several more members of the cast and crew. That’s when we started to get a sense of the scale of our project. Director of Photography James Daniel & 1st Assistant Camera Zachary Mills. Photo by Jill Steinberg. Tuesday, August 9th was perhaps the most challenging day of all. It started with a sense of optimism as Vita and Clark resumed work on the canopy and dance floor, while I took care of painting the boat that would make an appearance in one of the lake scenes. As the day progressed, however, our camera crew began to experience all sorts of setbacks, including equipment malfunction and mishandled deliveries, prompting a last-minute road trip to Boston to retrieve the right piece of equipment that very same day. 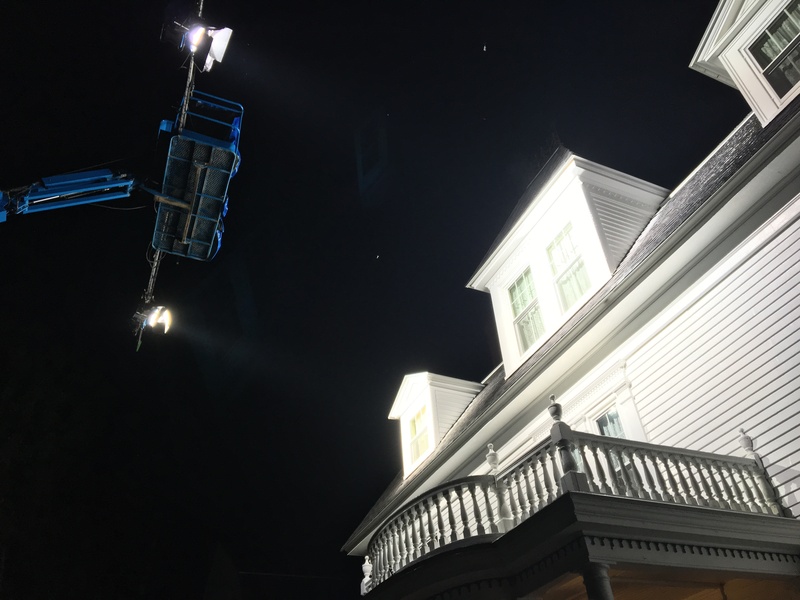 In spite of all the delays, our camera crew, lead by Director of Photography James Daniel, began filming that same night, but we had to stop shortly after, once the clock hit 3:00am. I won’t lie, the spirits were not high that night, but Kevin assured me that the first day of shooting is always like this (he later admitted to being slightly nervous about the whole situation, so kudos to him for not letting his nerves show!). On the other hand, I must admit that I was a little concerned about whether we were going to be able meet our deadline. 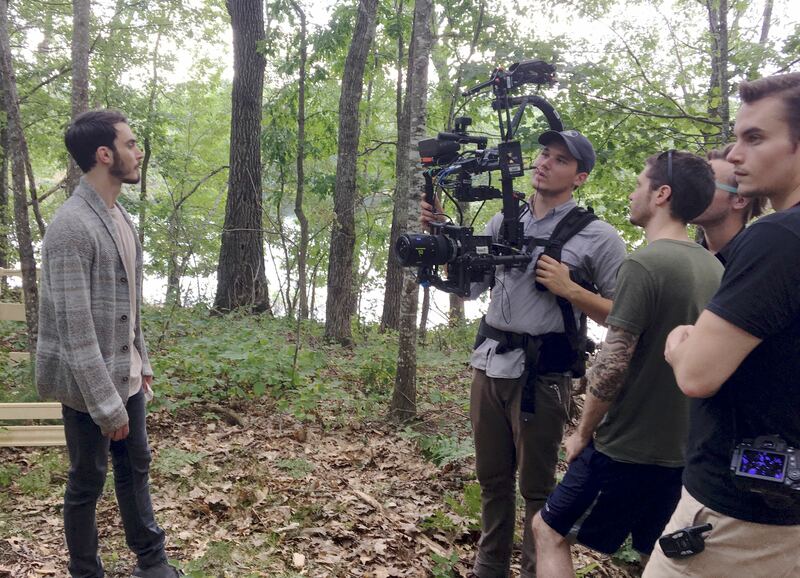 Actor Reed Luplau, 2nd Assistant Camera, John Mofield (carrying the MoVi), 2nd Assistant Camera, Zachary Mills, Director of Photography James Daniel & Assistant Director Marcus Shields. Wednesday, August 10th. Everyone wakes up eager to get started. I began the day with my accustomed swim across the lake followed by a canoe ride by whoever was willing to take me back to shore. (Thanks be to Clark, Sarah and Tyler for not leaving me stranded on the other side!) Once we had all had breakfast (prepared by our lovely hosts Ron and Raylene), we left for Parsonfield Seminary, a gorgeous 19th century building where we were going to shoot for most of the day. Our three actors, Reed Luplau, Cole Horibe and Catherine Curtin, took part on that shoot which, thank God, went smoothly, leaving everyone with a much-needed sense of accomplishment. After that shoot we were all pumped and ready to tackle perhaps the most challenging scene: the dance sequence, choreographed by the extraordinary Larry Keigwin. I had seen some of the rehearsals earlier that day, but nothing prepared me for the actual shooting, especially after I saw our two male actors dressed in their gorgeous tuxedos and our beautiful Cathy Curtin glowing in a nightgown designed by Paul Carey, our costume designer. 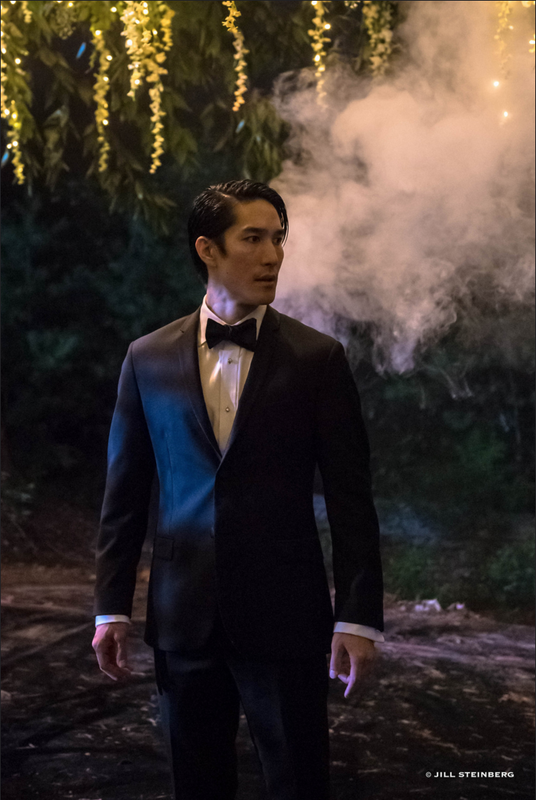 Actor Cole Horibe prior to shooting the dance sequence. Photo by Jill Steinberg. That night, we all gathered around the glittering dance floor conceived by Vita & Clark, and assembled by an army of helpers including our PA’s Taylor Bradford & Nicholas Corder; members of the extended Newbury family, including Kevin’s sister, Sarah; our screenwriter David and his husband Danny; and myself. The expectation was mounting, especially since the camera crew made the decision to film that sequence in a single shot. How, you might think, would this be possible? Well, it’s all thanks to the MoVi, which is essentially a portable camera system attached to the body by a harness that allows the camera operator to move freely while stabilizing the shot electronically (unlike the steadicam which tries to achieve the same effect through mechanical means). The hero of the night: First Assistant Camera Zachary Mills, who essentially had to dance along with our actors countless times and during several hours until we got the perfect shot, which we undoubtedly did. Of course it helped that our actors, Reed and Cole, are also accomplished professional dancers, so it was incredible to see how consistent their movements were on every single take. This allowed James and Zachary to choreograph his movements along theirs in what turned out to be a dance of three, even though the camera only shows two dancers. It was a taxing and excruciatingly difficult shot, but in the end we got exactly what we wanted. As everyone prepared to go to bed, our tireless Matthew Principe drove Reed to the airport to catch a flight the next morning so he could arrive to NY in time for his Thursday audition. It was all worth it in the end, because the next day we all learned that Reed got the part. Congrats, Reed! Actor Cathy Curtin during a gorgeous shot at the lake. Photo by Jill Steinberg. How different was the mood on Thursday morning compared to the day before! Wednesday had been a day of accomplishments and we were now sure to be on the right track. Thursday was, for me, one of the most physically demanding days in memory, but also one of the most fun. Our departments are so small that we constantly had people from other departments volunteering to help. This was the case especially that day, when Paul and Herin Kaputkin, our assistant costume designer, joined myself, David, Danny, Taylor and Nick in helping Vita and Clark build another complex set, this time inside the hallway of Parsonfield Seminary. As if torn from the pages of Narnia, Vita had conceived a forest inside the hallway of the seminary. As you can imagine, this was no easy feat, and it involved lots of wallpaper (pre-designed by Clark), wooden panels, small trees, branches, leaves, dirt, nails, staples and all sorts of heavy-duty tools. Thankfully we had some air conditioning to assuage the heat, which that day lingered between high eighties and low nineties. Even so, the task of building the forest was a sweaty undertaking, which demanded all the hands available to help. We were not able to finish that day, so Clark and Vita had to return the next morning to complete this daunting task by themselves. 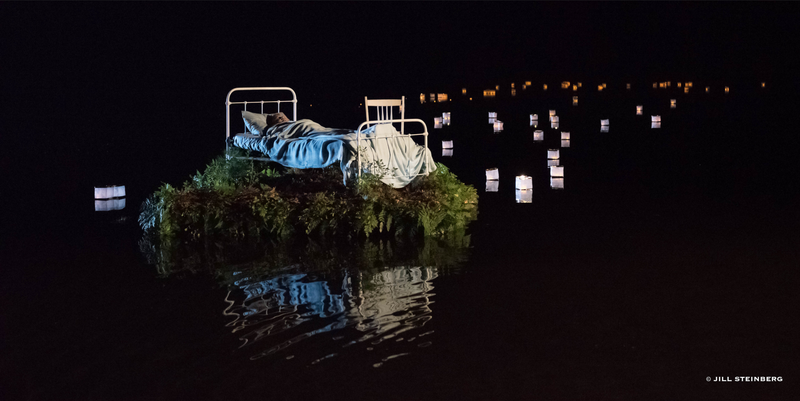 Once back in camp we immediately began to prepare the set for that evening’s main shoot: Cathy on top of a bed, in a tiny floating island surrounded by floating lamps anchored to the bottom of the lake. It was surreal, but as everything Vita conceives, it was strikingly beautiful and poetic. It gave me great joy to help build this tiny marvel, but its shooting was not without its difficulties. Zach and the underwater camera. The plan was to get one shot from the shore with the camera mounted on a horizontal railing and another group of shots from a drone operated by our second assistant camera operator, the sharp, charismatic and always cheerful John Mofield. We did indeed get the shots we wanted, albeit not exactly as we had initially planned. First, our shots from the shore were not turning out as striking was we had first thought, and second, the floating lanterns proved immensely difficult to handle, even though they all had weights attached to them so they could get anchored to the bottom of the lake. Many of us spent hours inside the water trying to control the trajectory of the lanterns, but the wind made that impossible, so in the end they disappeared in the background. 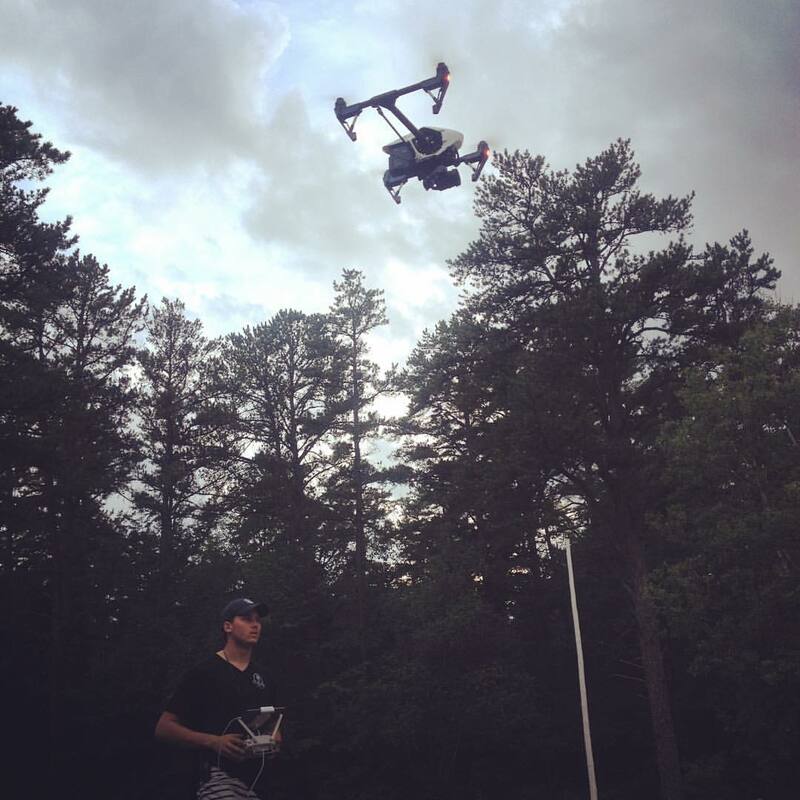 Also, our drone had experienced some technical difficulties that day, so instead of being operated by two people, as is the case usually, it had to be operated by a single person, John, who had to control the focus and the flight trajectory of the drone by himself. Kevin was slightly discouraged with the results and so was I, but a few days later, when we had the chance to look at the footage on a larger screen, we realized that it had turned out many times better that we had thought. Look! 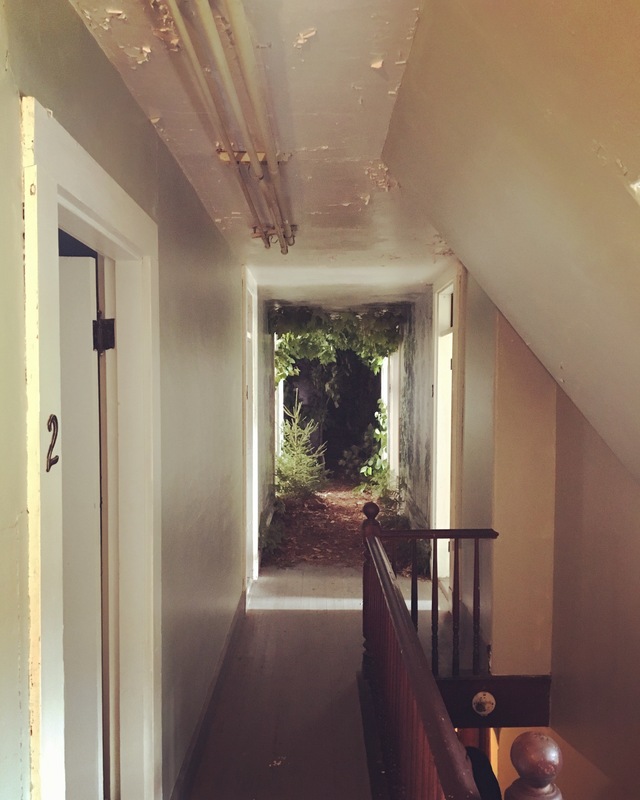 There’s a forest at the end of the hallway! Friday, August 12th: our fourth and second-to-last day of shooting. Vita and Clark head to the seminary to complete their dreamy hallway forest while the rest of us remain in the camp to witness and assist in the shooting of two important scenes. We begin with Reed entering a path of the forest, strangely furnished with beds from the hospice in progressive states of decay, when he suddenly sees Cathy and Cole walking up a hill. This sequence was also shot with the MoVi –a brilliant tool for shooting on uneven terrain- this time operated by John, while Zach took care of pulling the focus. (Oh, by the way, you can imagine how happy I got when Zach let me hold the MoVi the day before, even if only for a few seconds. I felt like a kid with a toy… a very expensive one!) Anyway, back to the forest. Once we wrapped up that scene we went back to the lake in what would be another full evening spent in my swimming trunks. This was one of the most exciting moments because we finally got to use the underwater camera. Reed had only one chance to get it right because once he dipped into the lake and got wet, there was no going back. The drone was back in business, this time fully functional, and we got all the shots we wanted right before the rain started to pour like crazy. The only glitch we had that day was due to a slight miscalculation of mine. You see, I had the mission to go out to the lake to locate and mark the spot where we were first going to shoot, so I got into a canoe with our Gaffer, Robert Newman and our Grip, Omar Nasr. Unfortunately, as I jumped off the canoe, I brought Robbie and Omar –camera in hand- down to the water with me (sorry guys!). Aside from that, everything else went smoothly… oops! The Genie, holding some potent lights to create the impression that we are shooting during the day. Saturday August 13th was our last day of shooting; we were on schedule, but this day ended up being as busy as any other day of shooting. We spent it at the Seminary shooting the remaining scenes, especially those where the hallway turned forest took center stage. I learned a lot about the technical aspects of shooting a film, and I kept hearing the camera guys drooling all over our master primes, which seem to be the pinnacle of camera lens craftsmanship, and which have only been around for the past ten years or so, making shots that were impossible, possible. (The same can be said of the MoVi, which has entered the market only recently.) Our actors were called to the set and magic ensued. Each take looked like a beautiful painting, with carefully calculated contrast and lighting. I was mesmerized. The most emotional moment, however, came when Cathy came to shoot the very last scene (the one I mentioned right at the beginning). Emotions poured and… you know the rest of the story. I have to give it up to our Hair and Make-Up Designer, Anne Ford-Coates, for creating some of the most heart breaking looks I’ve ever seen. One could simply not take one’s eyes away from Cathy. It was brilliant. We then all wrapped up our stuff, cleaned the set in record time and went back to the camp to celebrate with a celebratory meal followed by drinks, hugs, and tears of joy, exhaustion and excitement. We had accomplished what we had come to do. The next morning I had to dive to the bottom of the lake to retrieve the chain than had anchored the dock and which we had had to let go a couple of nights before for our lake shots. (Thanks, Clark, for your help and for being ready to perform CPR on me if needed!). Next, we went on to tear down the canopy and dance floor, took a shower, packed our stuff, and got ready to say our good-byes. Personally, this was one of the longest and shortest weeks ever. It’s strange but it all felt like a single, incredibly long day. There is so much to take in, of course, but I must say that I’ll cherish the friendships we built in the course of that week. Everybody gave their absolute best to make this project a success. 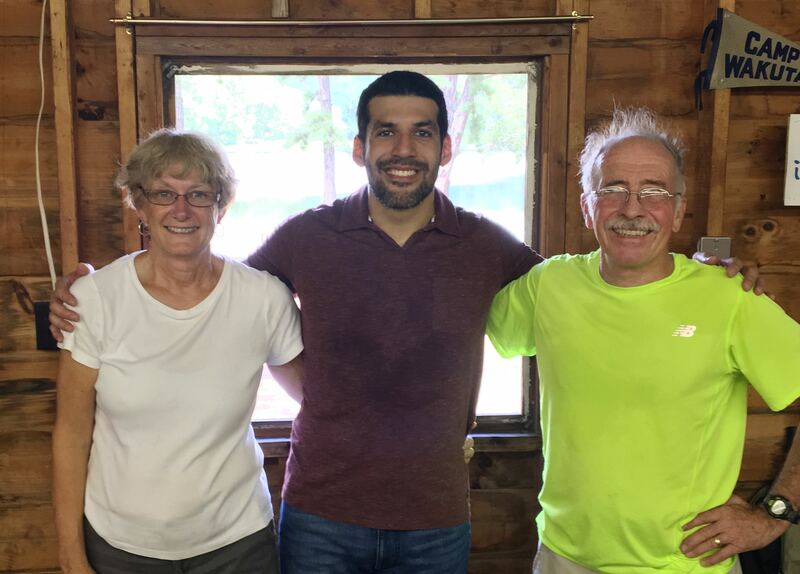 I want to give special thanks to Ron and Raylene for being such wonderful hosts and to everyone else for creating a fantastic work atmosphere devoid of egos and full of hard-working, down-to-earth people. We all did more than was asked from us and I am absolutely positive that this will reflect in the final product. Our film has now entered post-production, so we should be able to have a rough cut within the next few weeks. 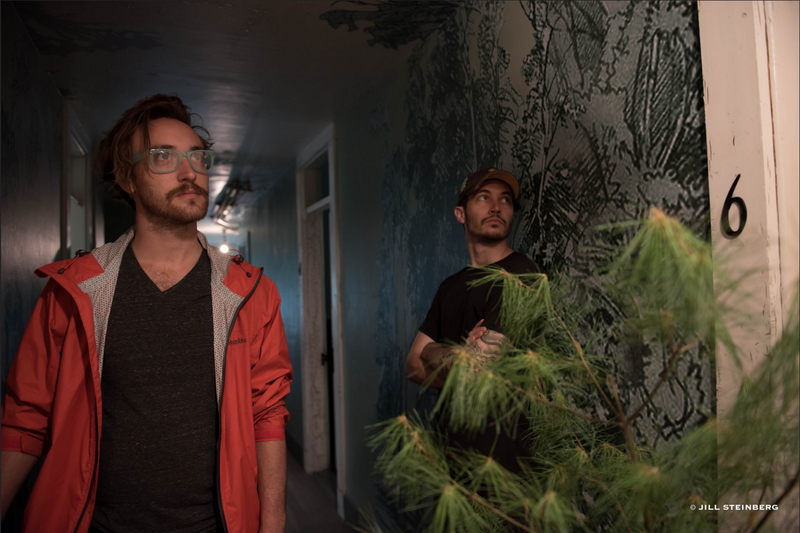 James and Kevin are now hard at work and we just can’t wait to share it with the world! Stay tuned. This entry was posted in Miscellanea and tagged #epiphanyfilm, Anne Ford-Coates, Camp Wakuta, Catherine Curtin, Clark Parkan, Cole Horibe, Danilo Costa, David Johnston, Drone, Genie, Herin Kaputkin, James Daniel, Jimmy Lopez, John Mofield, Kevin Newbury, Larry Keigwin, Loon, Maine, Marcus Shields, Matthew Principe, MoVi, New Hampshire, Nicholas Corder, Omar Nasr, Parsonfield Seminary, Paul Carey, PWM, Raylene Newbury, Reed Luplau, Robert Newman, Ron Newbury, Sarah Cross, Shaw Pond, Taylor Bradford, Vita Tzykun, Zachary Mills. Bookmark the permalink.